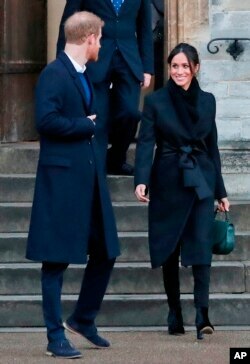 FILE - In this Jan.18, 2018 photo, Britain's Prince Harry and his fiancee Meghan Markle leave after a visit to Cardiff Castle in Cardiff. When Meghan wore jeans from the Hiut Denim Company, there was worldwide publicity about a firm in Wales which started to re-employ workers displaced when the local factory closed, helping small companies like Hiut buck the globalization trend. Claudio Belotti knows he cut the denim that became the jeans Meghan Markle wore on one of her first outings as the fiancee of Britain's Prince Harry. "There's a story behind each one," Belotti said. "You're paying for the skill." Customer demand for something unique is helping small companies like Hiut buck the globalization trend and set up shop in developed countries that had long seen such work disappear. While international brands like H&M and Zara still dominate the clothing market, small manufacturers are finding a niche by using technology and skill to bring down costs and targeting well-heeled customers who are willing to pay a little more for clothes that aren't churned out by the thousands half a world away. Their success comes from promoting their small size and individuality, said Jaideep Prabhu, a professor of enterprise at Cambridge University's Judge Business School. "It's a different kind of manufacturing," he said. "They are not the Satanic mills. These are very cool little boutiques." FILE - In this Jan.18, 2018 photo, Britain's Prince Harry and his fiancee Meghan Markle leave after a visit to Cardiff Castle in Cardiff. Hiut, which makes nothing but jeans, employs 16 people in Cardigan and makes 160 pairs a week. Women's styles range from 145 pounds ($192) to 185 pounds ($244), men's go for 150 pounds to 235 pounds. Each is signed by the person who sewed it, known in the company as a "Grand Master." By contrast, Primark says it sources products from 1,071 factories in 31 countries and keeps costs down by "buying in vast quantities." The most expensive pair of jeans on the company's website sells for 20 pounds. Hiut, for example, highlights its efforts to put people back to work in a small town that was devastated when a factory that employed 400 people and made 35,000 pairs of jeans a week shut down. Underscoring the years of craftsmanship that go into each pair of jeans, the company offers "free repairs for life." This kind of customer service helps form a "personal relationship" between a brand and the shopper that is valuable, says Anusha Couttigane of Kantar Consulting. "Well-crafted things bring more joy," she said. "I'd rather buy fewer things but know they're good quality [and] made by people who are working in good conditions for a fair salary." "Data is the backbone for this and the trigger," said Achim Berg, a senior partner at McKinsey & Co. in Frankfurt who advises fashion and luxury goods companies. "It's not custom-made, but it gives the consumer the opportunity to be more individual." A survey of 500 companies by McKinsey and The Business of Fashion, an influential industry news website, identified personalization as this year's No. 1 trend. Consumers are willing to hand over personal information to get more customized products and services, according to a 2016 survey by Salesforce.com, which provides online sales and marketing tools for businesses. Jenny Holloway, who employs 100 people at Fashion Enter in London, said she's not interested in making as many garments as possible and selling them as fast as she can. "I'd like to say we've done a massive business plan and we refer to it. We don't," Holloway said. "We sit down and have a cup of tea and we have a chat and we evaluate how things sit with us. How does that client fit our ethics? ... It isn't about money and making that big buck. It's about sustainability." Prabhu sees this as part of a bigger shift away from the model of outsourcing production to low-cost countries like China. "You're trying to constantly keep up with your customers. Your competitive advantage is to give them something closer to their needs." When David and Clare Hieatt decided to start making jeans again, they were determined to take advantage of the years of professional experience going to waste. They hoped that would give their products a "story" to market. Markle's decision to wear Hiut jeans in Wales boosted that effort. The company now has a waiting list of three months. "For the town it's been incredible because it gives people a confidence to go, 'Wow. This town makes a world-class product,'" David Hieatt said. "We lost our mojo when we lost 400 jobs, but now we're getting it back. That's a very cool story."